Let ISInc start your organization with a free trial and get Office 365 up and running in your organization easily. The trial will let your users experience the value that Office 365 can bring to them. Begin your Office 365 experience with helpful scenarios and how-to documentation for your users and IT professionals – all from within your own Office 365 environment. Ask an ISInc representative for information on how Office 365 can save your organization on hardware and IT support costs! One of the features of the Terminal Server/Remote Desktop Client in Windows 7/Windows Server 2008 is the support for multiple monitors. If the machine running the TS-Client has a multi-monitor configuration that creates one logical rectangle, then the TS-Client can span over all the monitors, creating one virtual desktop of the combined size. o Top-left monitor being the primary So, with this basic setup, let’s jump right in! 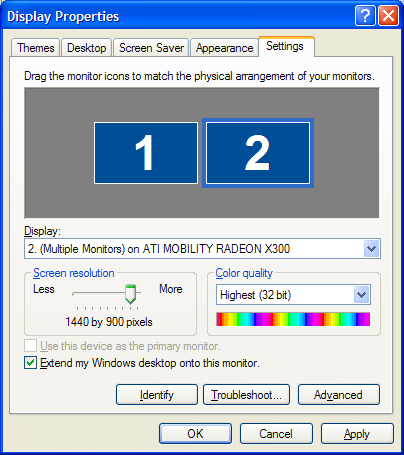 Make sure both your monitors are using the same resolution and are oriented horizontally. Right click on the desktop. Click Properties. In the Display Properties tab, make sure the monitors have the same resolution and are oriented horizontally. If not, adjust your monitor resolution and position so they are. 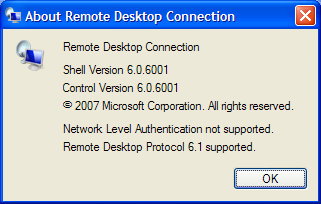 Check if you have the right version of Remote Desktop Connection client. 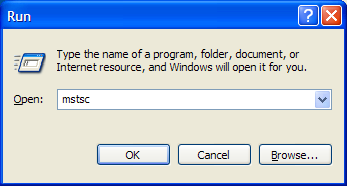 You need at least version 6.0In the Start Menu > Run… dialog, type “mstsc” and hit enter. 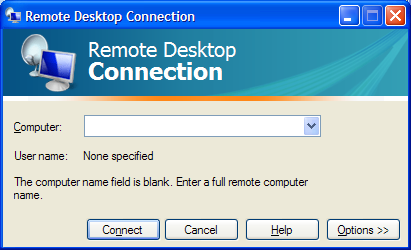 The Remote Desktop Connection program should open up. When the Remote Desktop client opens up, enter the remote computer name to which you are connecting, and click Connect. The Remote session should open up and cover both your monitors. Once you have this working, you may want to launch the remote session in an easier way instead of typing the ‘mstsc /span’ command everytime. 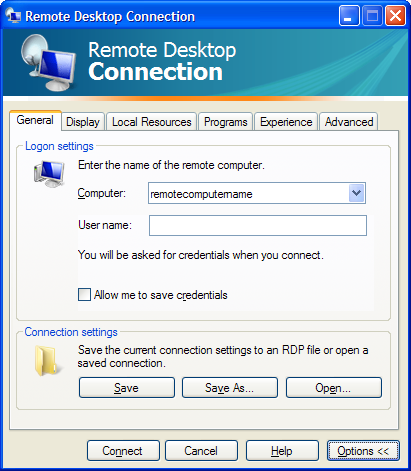 The next section shows how you can create an “RDP file”, so you can launch a spanned remote desktop session by just double-clicking a file/shortcut. 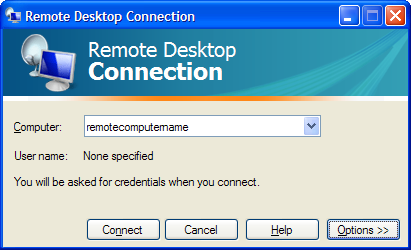 When the Remote Desktop client opens up, enter the remote computer name to which you are connecting, and DON’T click Connect. Instead, click the Options button. Now, close the Remote Desktop Connection program. We are done with this for now. 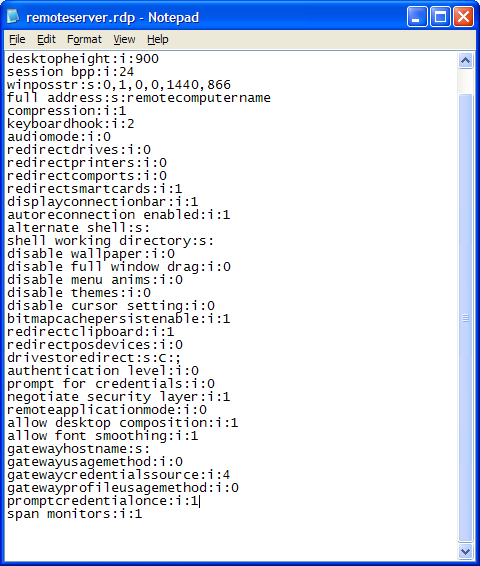 In the Open With dialog, choose Notepad to open the file. 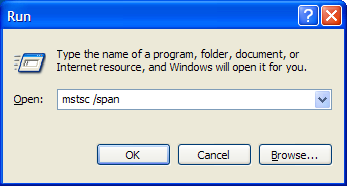 Remember to NOT check/enable the “Always use the selected program to open this kind of file” option. Click OK. The file should open up in Notepad. It is a file with many lines. We need to edit this and add one more line. Save the file (File menu > Save) and exit Notepad. From now on, you can connect to the remote computer using both monitors (in span mode) by just double-clicking this file. To add a shortcut to your desktop, right click the file, and choose “Send To> Desktop (create shortcut)”. 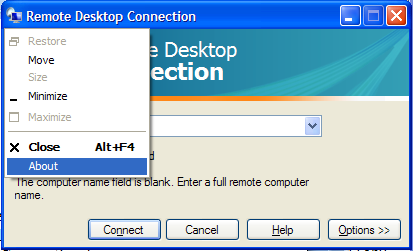 This will place a shortcut to this file on your desktop, and you can just double click the shortcut to remotely connect to the remote computer using multiple monitors in span mode. 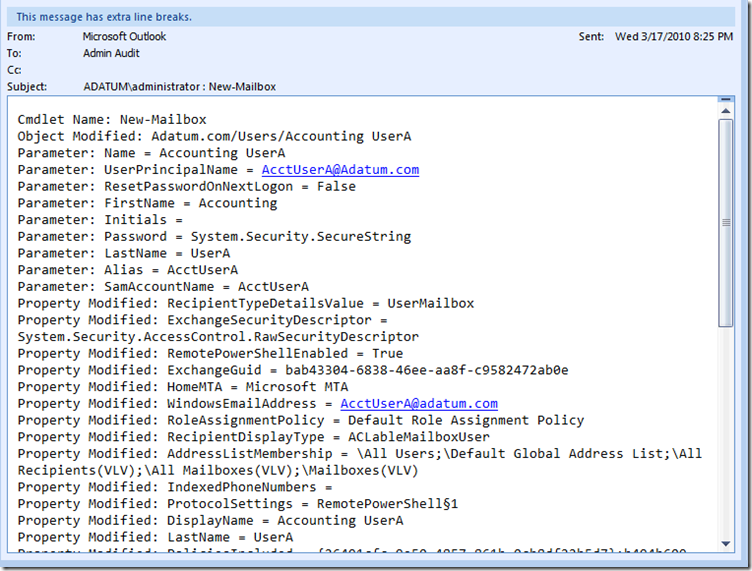 Microsoft just released an alert to provide you with an overview of the new security bulletin released (out of band) on Thursday, October 23, 2008. Microsoft has released security bulletin MS08-067, Vulnerability in Server Service Could Allow Remote Code Execution (958644), to address a vulnerability in all currently supported versions of Windows. This security update was released outside of the usual monthly security bulletin release cycle in an effort to protect customers. We request that you take action immediately by first assessing and preparing your own systems and networks and applying the security update, then reaching out to your customers to assist them in securing their systems and networks by applying the update. This security update resolves a privately reported vulnerability in the Server service. The vulnerability could allow remote code execution if an affected system received a specially crafted RPC request. On Microsoft Windows 2000, Windows XP, and Windows Server 2003 systems, an attacker could exploit this vulnerability without authentication to run arbitrary code. It is possible that this vulnerability could be used in the crafting of a wormable exploit. Firewall best practices and standard default firewall configurations can help protect network resources from attacks that originate outside the enterprise perimeter. The security update addresses the vulnerability by correcting the way that the Server service handles RPC requests. Microsoft recommends that you assess your systems and networks and apply this security update to secure your systems and networks and to help ensure that your computers are protected from attempted criminal attacks. This security update is rated Critical for all supported editions of Microsoft Windows 2000, Windows XP, Windows Server 2003, and rated Important for all supported editions of Windows Vista and Windows Server 2008. Microsoft Baseline Security Analyzer can detect whether your computer system requires this update. The update requires a restart. · For Windows Vista and Windows Server 2008: WUSA.exe does not support uninstall of updates. To uninstall an update installed by WUSA, click Control Panel, and then click Security. Under Windows Update, click View installed updates and select from the list of updates. MS06-040 is superseded on these operating systems: Windows 2000 SP4, Windows XP SP2, Windows XP X64, Windows Server 2003 SP1, Windows Server 2003 X64, Windows Server 2003 SP1 for Itanium-based Systems. We recommend that our customers use the Microsoft TechNet Security TechCenter as a key source of security information: http://technet.microsoft.com/security, and that you sign up for comprehensive alerts at http://www.microsoft.com/technet/security/bulletin/notify.mspx. 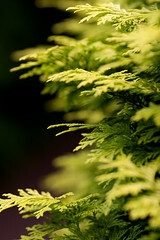 We strive to provide you with accurate information in static and dynamic (Web-based) content. 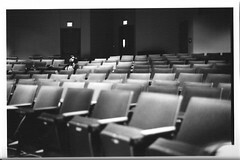 Microsoft’s security content posted to the Web is occasionally updated to reflect late-breaking information. If this results in an inconsistency between the information here and the information in Microsoft’s Web-based security content, the information in Microsoft’s Web-based security content is authoritative. If you are interested in ISInc support to keep your networks up to date, please contact us at 916-920-1700 to hear about our Managed Services options. Have Software Assurance? Don’t Let Your Training Vouchers Expire! 3 Comments on Have Software Assurance? Don’t Let Your Training Vouchers Expire! ISInc awarded Novell Partner of the Year! ISInc is the 2008 Novell Partner of the Year for Training. This is a great accomplishment and it has to do a lot with our team here at ISInc. Thank you to all of our customers who have helped us achieve this benchmark within the Novell organization! We have been a partner with Novell since their program inception. ISInc continues to maintain a Novell Platinum rating and we look forward to rolling out more services soon. Take a look at the classes we have to offer in the Novell section of our website.